Lily of the Valley flowers are petite and delicate flowers with fragrant, bell-shaped flowers. They are popular for brides wedding bouquets. They are packed in bunches of 10 stems with foliage, measuring about 8 inches high. Each stem contain multiple bell-shaped flowers. They are available year round it is recommended you order at least one month prior to your event to ensure product availability. Lily of the valley is famous for its white and bell-shaped flowers which have an intoxicating scent. According to legends, the flower supposedly came from Eve’s tears following her exile from the Garden of Eden. The flower is known to bring luck in love and hence, stands to be the perfect choice for wedding arrangements. The flower is known as the flower of the month May. The scientific name of the flower goes by majalis that denotes it belongs to May. The classic flower of spring manages to lure many hearts and is native to multiple continents. 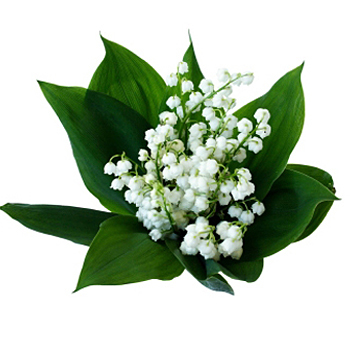 You can easily buy fresh lily of the valley from trusted online florists like Whole Blossoms. It can be found in parts of Asia, North America, and even Europe as it mostly grows in temperate forests. The flower name might make it sound like it belongs to the Lily flower family, but it's actually a part of the Asparagaceae family. It is widely called the flower of fairies and is famous for wedding bouquets. The flower resembles tiny bells which can be used as cups to drink from. In many cultures, it is known to signify the vision of heaven which points towards a bright future. It is also called as the official flower for the zodiac sign, Gemini. It stands to represent purity, happiness, and modesty in any setting of floral arrangements. Since the middle ages, it has widely been used in weddings by brides. In the country of Holland, the flower is even planted in the couple's house which stands to represent the beginning of love. The fragrance of the flower is very famous and used in many religious ceremonies, events, and perfumes. The flower finds a significant place in ancient Christian folklore. Where to buy lily of the valley with the best quality and price? Buy fresh lily of the valley from reliable online florists like Whole Blossoms and get it delivered right to your doorstep. You can quickly get your hands on fully assembled lily of the valley through trusted online floral shops. Come up with creative ideas to include these charming flowers in any wedding floral arrangements like bride bouquets. Put your trust in Whole Blossoms to deliver you with the best and fresh quality of flower arrangements. You can also get fresh cuts with a bulk purchase of these glamorous and ancient flowers to decorate any special event. Lily of the valley represents the renewal of love and have the ability to charm anyone with their enchanting appearance. Hence, these flowers are trendy for weddings and can correctly synchronize with the subtle look of the bride and bridesmaids. These flowers can be a blessing to floral setups. Select the flowers and get it delivered fast right to your doorstep with a single click. The raw nature and beauty of lily of the valley are never-ending.